Some words can kill. Even those one wouldn’t have thought so to look at. Consider “self-murder.” Perpetrators of this supposed crime die a second, linguistic death in retribution for their deed — eye for eye, tooth for tooth. Persons who utter the word send a clear message: take your life and you kill not only yourself but also the society that feeds you. For many centuries, loss of honour, memory, and property followed the act as a posthumous reminder. At stake was more than a symbolic, social death. Even in the late nineteenth century, British courts could punish attempted self-murder with death by hanging. Religion usually supplied the rationale. For the God-fearing judiciary, those who repudiated the gift of life disturbed the order of creation. God’s representatives on earth could not let such a transgression go unpunished, and denied the guilty the salvation of a Christian burial. Other words can liberate. “Voluntary death” takes against the condemnatory tradition and insists on the moral right to end one’s own life, even if few choose to do so. Today English speakers typically use the ostensibly neutral term “suicide.” Its use has become so natural and widespread that its historical origins have been mostly forgotten. The word originated under the influence of Enlightenment thought, as denunciation of the deed gradually gave way to empathy for the doer. In England this process began in the 1650s; in France and Germany it started in the second half of the eighteenth century, with German giving rise to the equivalent term Selbstentleibung (“self-disembodiment”). The attendant decriminalisation of self-killing turned self-murder into suicide. Sinners and criminals became victims and patients, melancholics and the mentally ill. The notion of suicide rendered the act’s aetiology more important than the act itself. A pictorial representation of this conceptual shift can be found in William Hogarth’s cycle Marriage à la Mode (1743-45). The six-painting series depicts the unhappy consequences of an arranged marriage between a wealthy merchant’s daughter and the son of a bankrupt earl. The woman, bored by her husband of convenience, soon embarks on an extramarital liaison with a silver-tongued lawyer. At a tryst in a bath house, the two lovers are surprised by the cuckolded spouse, who is then fatally wounded in a scuffle with the paramour. In the final painting the woman poisons herself out of grief after her lover is hanged for murder. William Hogarth (1697-1764), “The Suicide of the Countess,” from Marriage à la Mode, The National Gallery, London. At first glance, the cycle seems not to condemn suicide but to track its causes and circumstances, not to judge the deed but to understand its origins. Yet there’s reason to doubt the veracity of this apparent liberation. Historically, the concept of suicide did not simply replace that of self-murder. While self-murder is the older term, it only predates suicide by several decades, appearing in the second half of the sixteenth century; both entered the vocabulary of the early modern era more or less together, and have coexisted ever since. They made self-killing into a linguistic entity and with it, into a matter of fact, first juridical and then moral. 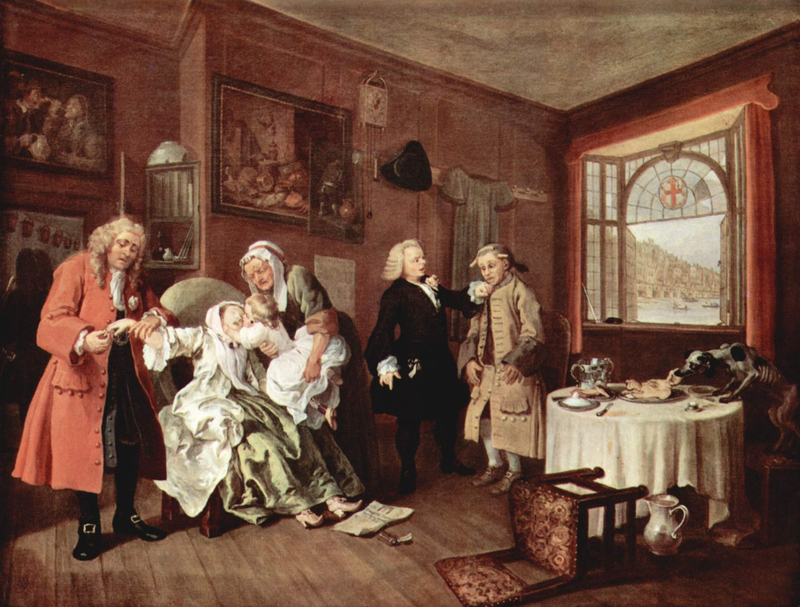 Hogarth seems to trace the woman’s death back to a moral error, saying in effect: look what happens to couples who enter into arranged marriage. But the narrative’s implied premise is that suicide is morally reprehensible. Accordingly, it is neither accident nor sloppiness when Samuel Johnson, in his Dictionary of the English Language (1755-56), defines suicide as “Self-murder; the horrid crime of destroying one’s self,” or when the reformed preacher Jean Dumas titles one of his works, a particularly voluminous tome, Du suicide ou du meurtre volontaire de soi-même (1773). 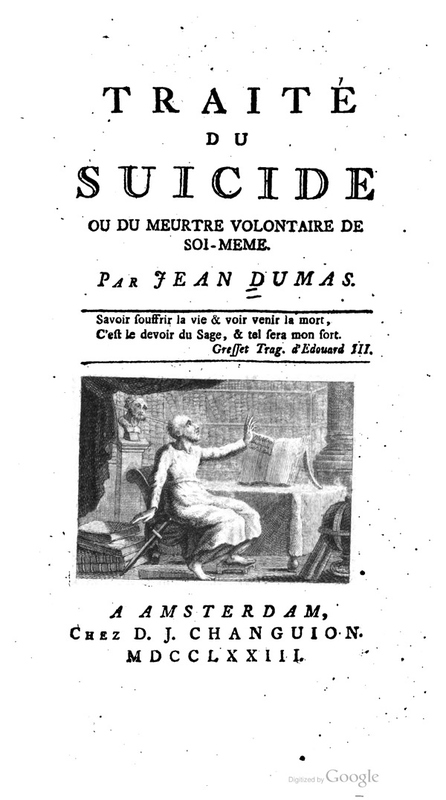 Jean Dumas, Traité du Suicide ou du meurtre volontaire de soi-même (Amsterdam, 1773). In the course of the eighteenth century a person who took his or her own life assumed, almost invariably, the status of a melancholic adjudicated as mentally incompetent. The reclassification failed to exorcise the underlying moral stigma, however: pathologization implied the original contemptibility of the act it sought to exonerate; otherwise there would have been no need for it. Pathologization and contemptibility frame the modern idea of what it means to be a free and morally autonomous person; which is to say, of what it means to have forsaken the sphere in which God and His servant the Devil determine human action. Going hand in hand with this perspective is a concept of society that is vulnerable to suicide while also being one of its sources, though not its ultimate cause. In the late nineteenth century the belief that self-killing was the symptom of individual and societal illness was systematized in the study of suicidology. The discourse’s psychiatric, psychological, and sociological categories, by eliminating individual accountability, removed from the deed its culpability as well as its dignity. Those with suicidal tendencies are now placed in the custody of a therapist; the invention of suicide merely replaced one stigma with another. To this day, whoever takes his own life can hardly hope for understanding. Who knows how many this knowledge has driven to despair. Andreas Bähr is a researcher at the Free University of Berlin. He is the author of “Between ‘Self-Murder’ and ‘Suicide’: The Modern Etymology of Self-Killing” (available to read for free for a limited time) in the Journal of Social History. The Journal of Social History has served as one of the leading outlets for work in this growing research field since its inception over 40 years ago. JSH publishes articles in social history from all areas and periods, and has played an important role in integrating work in Latin American, African, Asian and Russian history with sociohistorical analysis in Western Europe and the United States. Subscribe to only language articles on the OUPblog via email or RSS. Images: (1) William Hogarth (1697-1764), “The Suicide of the Countess,” from Marriage à la Mode, The National Gallery, London. Public domain via Wikimedia Commons. (2) Jean Dumas, Traité du Suicide ou du meurtre volontaire de soi-même (Amsterdam, 1773). Public domain via Google books. I, 76, have never met anyone who “stigmatized” suicide. I have experienced about a dozen deaths by suicide, and not once did any do less than mourn, comfort, and cried. The term has become “popular”, the practice not. Suicide is a hopeless resolution. Suicide is a cry for help and change. Suicide is the blame for loss of love ones. This and more suicide played a major role in. Suicide is a permanent solution for a temporary problem. and the act will always be greater than the cause.